Bohemian Earth: Handcrafted Jewelry: New Listings! My move was exhausting and it's been a while since I've posted any pieces. But, I've been thinking and dreaming up designs the whole time! I'm working on three custom orders and I just made two one-of-a-kind bracelets, both made with parts from a vintage necklace, which are available on Etsy. The first bracelet is another piece in my Teagan collection and the second bracelet is my first "reinvention" piece. 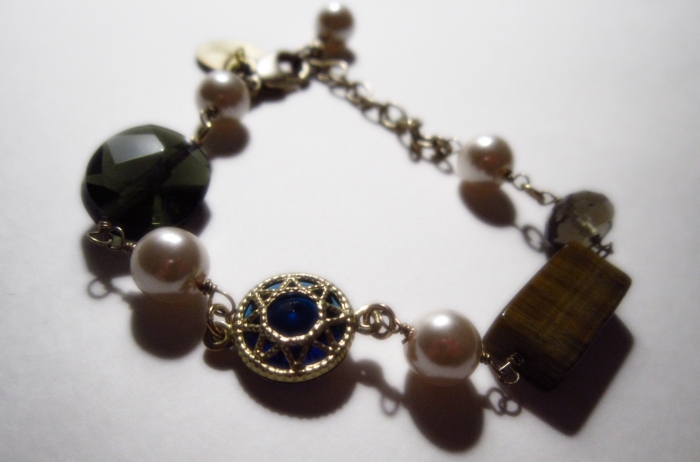 Read in depth about the second bracelet, largely composed of vintage necklace pieces, here on my blog. I'm looking forward to a holiday season full of creating! I'll be running special promotions beginning this weekend through December. Check my Etsy store Banner, located on the main shop page, for details.